If you haven’t seen this Diego Maradona video that’s doing the rounds, it really is a must-watch from the Argentina legend. The 58-year-old, formerly known for being one of, if not the greatest footballers of all time, is now manager of Mexican club Dorados. It’s certainly a big-name appointment for them, and for the Mexican league in general, which doesn’t have the worldwide appeal of some major divisions in world football. 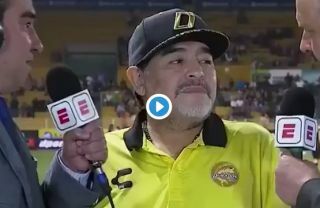 Maradona hinted as much in this interview, with the former Barcelona and Napoli man basically speechless when asked afterwards to talk a bit about Mexican football.